Today, we're facing one of the most dramatic transformations we've ever undergone: SDI to IP. Unlike many market sectors, the broadcast industry has been slow to jump on the IP bandwagon because it's completely different from the SDI infrastructure on which we universally depend. SDI is a mature, standardised technology that provides frame-accurate switching, fixed low latency, and synchronised video and audio, among other capabilities that are critical to making, moving and monitoring video and audio signals in live, real-time applications. Broadcasters have millions of pounds worth of SDI gear in their facilities and they still hope to realise a return on that investment. We also have Quad-3G-SDI (4 x 3G-SDI) or 12-Gigabit SMPTE UHD-SDI standard connections that can handle the demands of uncompressed 4K Ultra-High-Definition (4KUHD) signals today, while the current 10-Gig-E IP backbone cannot. The move to IP is becoming more attainable as the cost of off-the-shelf commodity IP switches and other IP networking gear falls and, with 40-Gig-E and 100-Gig-E infrastructures becoming more prevalent, offering the greater bandwidth necessary to carry that UHD load. A single, standard Gig-E cable can replace multiple, costly SDI cables, and the ubiquitous Internet or corporate LAN can replace a complex SDI infrastructure. And instead of having to hire specialised broadcast engineers-a skillset that's becoming scarce-facilities can employ those with expertise in the growing IP/IT engineering field. It also becomes easier to employ virtualised server-based operations and cloud processing and distribution. While all of these trends are pushing us towards an all-IP future, this industry finds itself in a hybrid SDI/IP state, with each facility transitioning at its own pace from the dependable, proven SDI technology we've known to the promising, new IP domain. A successful move to IP hinges on standards. Standards are critical to interoperability, encapsulation, frame-accurate switching, signal timing, synchronisation, and other capabilities that the video industry depends upon. While the industry is definitely moving towards the adoption of a particular family of standards for IP-based operations, the inability to agree on a complete set of standards is delaying the migration to IP. Attempts to build an all-IP-based broadcast infrastructure right now are not without challenges, risks and compromises. Pioneering broadcast facilities may need to make fundamental infrastructure decisions with no guarantee that their chosen standard will be universally adopted. Or they may find they're locked into a particular end-to-end IP solution from a single major manufacturer, and possibly living with some gaps or compromises in that workflow. As broadcasters seek answers about IP-ready and IP-capable equipment options and clarity about the new Video/Audio-over-IP standards, we at TSL Products have been designing hybrid solutions and platforms that facilitate a smooth, fluid transition. We've done this by supporting and integrating 3G & 12G-SDI for video and MADI for audio right alongside Video/Audio-over-IP capabilities. Since one needs a crystal ball to know for sure which of the new IP standards and migration paths will ultimately win the format wars, we've chosen to remain agnostic, and to support the leading standards. Our PAM-IP-uncompressed Video over IP audio monitors-gives customers a choice of connectivity, such as SMPTE 2202-6 and 2202-7 for uncompressed video over IP and Dante and Ravenna (AES67-based) protocols for audio over IP-in addition to SDI, MADI, AES-EBU and analogue signals. With this design approach-including support for both SDI and Video/Audio IP standards within the same platform or solution-broadcasters won't need to worry about making forklift upgrades to replace all the gear they have today. They can also rest assured that when they pull their video truck up to a venue for remote production, they'll be prepared to connect with whatever standards and formats they find there. They can capitalize on IP's advantages today, and then gradually migrate to an all-IP infrastructure when the timing is right for them. Another important issue is that SDI offers a broad, comprehensive set of tools, including systems for control, monitoring, routing and other digital glue and infrastructure products. For example, our TallyMan Control Systems product enables management and control of multiple pieces of broadcast equipment, such as routers, under monitor displays, multiviewers and vision mixers from a single platform. Since these capabilities make production, master control, quality assurance and broadcast much easier, we've been integrating IP protocols into TallyMan so that broadcasters can leverage the same control and monitoring capabilities they've enjoyed in the SDI realm when they're working in a hybrid or all-IP workflow. This transition to the all-IP domain is gaining momentum and cannot be stopped. 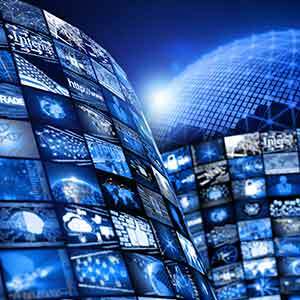 But many broadcasters will hesitate to undertake an all-IP-based facility upgrade until they are certain that they will not be jeopardizing their on-air products and branded services. And they want to be sure that their IP infrastructure is ready for a future that will likely include the delivery of real-time 4K UHD premium services. Based on our customers' requests, we intend to continue expanding our product portfolio with high-quality, reliable products and platforms designed to handle multiple SDI and IP signals, without sacrificing the features and functionality broadcasters have come to expect.